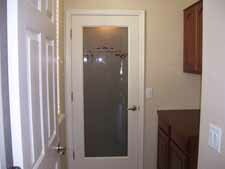 As we go through this Peoria Arizona new home, you may want to open the Walden floor plan in a new window. Use the "flip" command once the floor plan is open because the model we toured is aligned the opposite of the floor plan that comes up with this link. The sitting room is just off the front door. I am not a big fan of a sitting room, but that is because of the stage of my life I am in. I need more usable space, and I think for resale you are going to be better off if you turn this in to a bedroom. 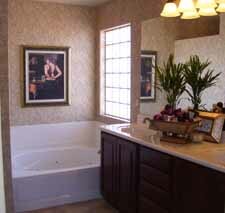 I think the full bath option next to this room instead of a powder room is going to offer more in resale value as well. You can also turn this room into a den. The next photos are two different angles of the kitchen. 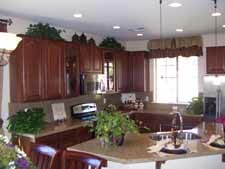 The kitchen in this Peoria Arizona new home is nicely designed, and you can see on the floor plan that you can rearrange it different ways if you wish. I particularly like the island the way it is angled in the model, because you can throw some barstools in and create more eating space for company or the kids. Just through the kitchen is the laundry room. Now I wouldn't normally point out the laundry room, but I like how Maracay connected the under stair case storage to the laundry room. Usually the storage space under the stairs is full of random stuff. I think having it next to the laundry room is a great idea. I need more storage in my laundry room, I bet you do to. This home provides it. When we walk upstairs this is the only part of the home that I don't particularly like. This is a small issue, but I don't like the desk area up here in the loft. I think this is meant for kids to do their home work, but it's never going to be used. 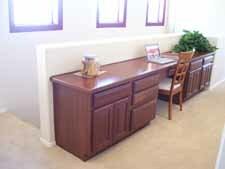 I think the space would be better utilized with cabinets. 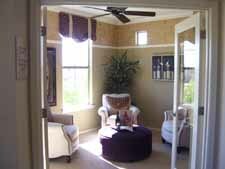 The master bedroom and the master bathroom are very typical for Peoria Arizona new homes. 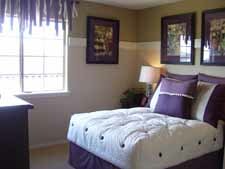 The bedroom has enough space for a king size bed and a few pieces of furniture. The master bathroom does have double sinks which I am a fan of. I like to have my own space in the bathroom when I am getting ready. There isn't any extra room in the bathroom though. The other bedrooms in this Peoria Arizona home feel a bit bigger than typical. You can see from this picture that there is a full sized bed in here with enough room for the dresser and space to move around. There is also a very large game room upstairs. It is very nice if you are looking for space upstairs to hang out in. 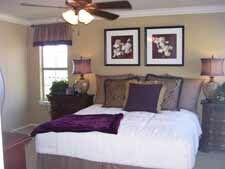 The game room could also be a guest room with full bath, two additional bedrooms with a shared bathroom, or another master bedroom with a full bath. The home really is very flexible. Overall I really think this home has a very nice floor plan. The different options available to customize the home with Maracay's flex design really enable you to turn this home into the perfect home for you. 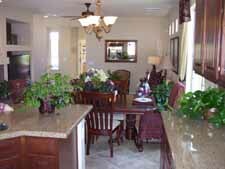 The model for this Peoria Arizona new home is three bedrooms and two and a half bathrooms, it is 2,518 square feet and starts in the low $300,000s. The flex design options allow you to change this home from a three bedroom home into having as many as six bedrooms and four bathrooms. The biggest drawback is that these are patio homes so there is very little back yard, but if you like that these homes may be perfect for you.